Today, Porch member Alex Pollack shares a challenge that is shaping his writing life in 2019. Try it yourself, then tell us about your experience! So you say you’re a writer. That’s great. Express yourself. Be heard. Go for it. But what does being a writer mean? Not only was Summer in St. Louis never published, but the New Release shelf at Borders went extinct when the store declared bankruptcy and liquidated all of their retail outlets. Then, my ex-girlfriend’s father Frank moved to Florida, got tan, and stopped reading books. So what does being a writer mean? d. You’re a writer because when you write, you want to write more, and because you think about writing when you’re not writing, and because, no matter how many breaks you take or how many excuses you make, you’re going to find yourself writing again. d. You’re a writer because you write. I’m a writer because I write. I like how that sounds, but the more ambitious my writing goals are, the easier it is to make excuses for not achieving them. A novel? A story? An essay? To be worth reading, all deserve vision and precision that come only with a lot of time and effort, but why give all of that when your work can get lost in the endless scroll of screens? Wouldn’t it be better just to sit back and consume? There’s enough writing in the world without yours and mine, right? Maybe, but so what? Most of us are compelled to write not out of global necessity, but out of personal need. You’re a writer because you write. In When: The Scientific Secrets of Perfect Timing, Daniel H. Pink notes the productivity hacks of successful people like comedian Jerry Seinfeld, who draws a big X in each slot of a calendar to mark the days he comes up with a joke. One X becomes two becomes three becomes more, a visual reminder to not break the chain of making something new every damn day. Inspired by Seinfeld, I’ve begun marking Xs on a monthly calendar for each day I write at least one new sentence. 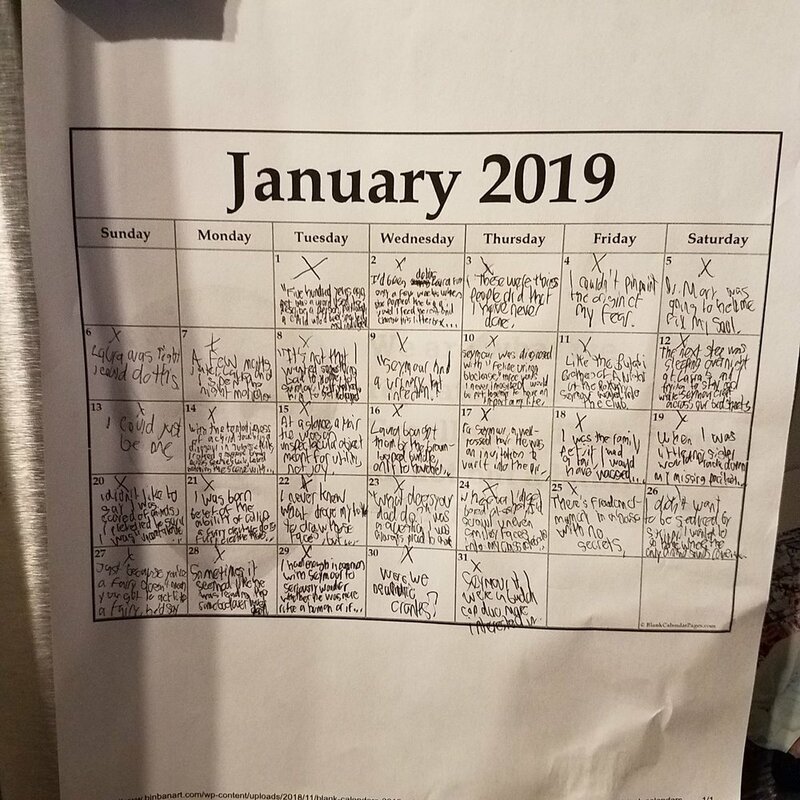 Before I can open my refrigerator, I have to come face-to-face with my current month of sentences and be reminded that each day is blank until I fill it. Why a goal of just one sentence a day? While there’s so much you can’t control in terms of publication and readership, you can control the syntactical snap of a coherent or not-so-coherent thought. No matter how busy you are, there’s joy to be had in giving yourself the mental space, if only for a few minutes, to turn a phrase on a page. It can happen in the shower, on a commute, or during a short walk: a vague feeling turning into a concrete idea hungry for the tenterhooks of subject and verb. When I drew an X over January 1 and the days that followed, I celebrated little victories that owed nothing to agents, editors, or literary gatekeepers. While most of these sentences won’t survive later drafts, they serve their purpose; they trick me into writing more. Two months later, I’m in various stages of three essays and a short story. But what if all this hard work ends in rejection? Rejections from the gatekeepers don’t hurt as bad when you can point to a different scoreboard. Hey, Gatekeeper! Each X means I’ve created something with a beginning and an end, my words and my commas hammering into place on my pages! Look at my refrigerator door, you gatekeeper! Enough with dwelling on the stories you’ve never finished. Enough with waiting to be creative until a mythical time called “later.” Enough with the excuses. Borders is dead, but you’re not. Let’s get back to the basics. Let’s build a chain of Xs. Let’s write some sentences.